LakeTahoe is beautiful, encompassing the best scenery of both California and Nevada. I'd been there twice before very briefly, but never really explored. My wife suggested this year's family vacation be a road trip to somewhere new for us, so we chose this area. We packed up the car and headed almost 10 hours north. The last hour of that ride offered breathtaking vistas of the mountains and rivers. As we rode into Northstar California to check into our condo, we knew we arrived at someplace special. I can best describe this complex as a stunning ski resort village with luxury hotels, restaurants, stores, outdoor skating rink, movie theaters, gondola and condos. And it's gorgeous. The two-bedroom unit we checked into was located directly underneath a whisper-quiet ski lift gondola. It had all the comforts of home -- replete with very comfortable king-size beds, WiFi, cable TV, fireplace and full kitchen -- perfect for our three-night stay. A four-minute walk down the hill and we were in the epicenter of Northstar's entertainment hub. Because it was dinner time when we arrived, we headed to Tavern 6330' on property. It's a restaurant presumably named after its altitude, with a really nice yet casual atmosphere. That vibe carried over to the menu. We decided to all order something different and then share. The steaks and chicken were outstanding, as were the crab chowder and salad. I washed it all down with a glass of cabernet, my wife with a deconstructed gin and tonic. It was a perfect welcome to our vacation -- and antidote to sitting in a car all day. After some gelato for dessert in the village, we headed back up to our condo. I'd forgotten about altitude adjustment, and we were winded after the short walk back up. Needless to say, everyone slept soundly. The next morning, we took a 10-minute drive to downtown Truckee. It's a throwback town stretching a half-mile with shops, restaurants and bars lining both sides. It's touristy, and an interesting place to check out. We wound up at a mom-and-pop diner, Wagon Train Coffee Shop, for pancakes and omelettes. After filling up, we went for a drive to check out nearby Kings Beach. The weather was ideal -- around 80 and sunny -- so the area was packed with swimmers, jet skiers and boaters. There was also an "art in the park" event, so we were able to check out work from some local artists. We also stopped in some shops. While walking, a mother and her child passed by. "When will Daddy be done golfing?," asked the youngster. His mother was quick to respond: "He'd sure better be back when we get to the room." I have a feeling that this sentiment is common in Lake Tahoe. There are so many family activities available, yet the golf is highly touted. Add in that there are plenty of solid golf courses around, and it's a recipe for fathers to bless their wives with some alone time with the children. That said, I don't ever want to be "that" guy stranding my family on vacation, while I run away for the bulk of the day to play golf. So I always like to bring at least one of our kids on the course with me, as well as my wife. But she's not really a golfer. And this afternoon, I had a tee time. So while my wife and son went to the movies, I took my daughter to play some golf at the Northstar California Resort course. It's a 6,781-yard Robert Muir Graves design with a split personality. The front nine -- a.k.a. the meadow nine -- is rather flat and wide open. The greens and fairways are immaculate, and everything rolls pretty true. It's a spoid test, yet my daughter and her golf inexperience also had a good time. The back side is known as the mountain nine, and it requires a lot more skill. In fact, my daughter played little on that nine, but still enjoyed herself riding in the cart and snapping photos. It's an incredibly scenic nine, with several holes showcasing dramatic elevation changes. And I kept forgetting until it was too late that you get an altitude distance boost to your shots. I almost felt bionic after seeing the length of some drives. Regardless, after riding the bogie train on the front side, I rifled off seven consecutive pars to finish the round. I played from the tips, and still with several of the uber-downhill holes on the second nine did not have to use my driver to find the proper landing areas for approaches. Overall, I thought this was a great course and lots of fun to play. If you're a higher handicap, just know that the back side is much tighter and winding than the front. So bring some extra golf balls. I was bummed that we missed a Glow Golf event, which is a family affair that you can play golf under the stars with glow-in-the-dark balls. It sounded like a blast! 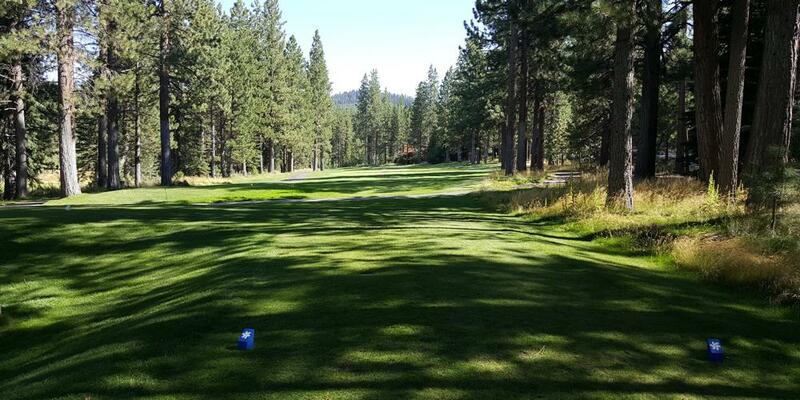 The following day, I had a tee time scheduled for Schaffer's Mill Golf & Lake Club, an award-winning, highly rated, upscale course in Truckee. Unfortunately, my plantar fasciitis had kicked in. It hurt so bad I could barely walk. My wife, though, meandered down to Tahoe Spa and Wellness in the main complex, for a hot stone massage. She needed it, given the long ride up to Tahoe with her tight back. When she returned, she had a glazed smile on her face because she was truly that relaxed. But this vacation wasn't all about kicking back. We had things to do, like taking the five-minute gondola ride up the mountain -- no stress on my foot. We took in the amazing view up there from about 7,000 feet. And then we rode the gondola back down, ears popping along the way. With my foot condition, sitting was my best option. Fortunately, our family had scheduled a white water river rafting tour for the afternoon -- where I knew I could sit. My only prior experience with this was a ride at Disneyland. Not a thrill seeker, I was terrified. Especially because today we would conquer a 12-mile, intermediate-skill route. But it was a blast. And unlike two of the other families on the tour, we did not flip into the water. It was more upper body work than I expected, but still plenty of fun. And now we have a lifetime memory. Needless to say, we were exhausted afterward. We returned to Northstar and ate dinner at Rubicon Pizza in the village complex. Our BBQ chicken pizza and cobb salad hit the spot. After another stellar night sleeping, we stopped at Starbucks downstairs for a quick breakfast before heading for the highway home. We all agreed that we'd love to come back up during winter, to experience what Northstar is all about in cold weather -- the skiing. I understand it gets even more charming up here, when snow blankets the village. For example, once you ride the gondola up the mountain, you can have a romantic dinner and drinks in the lodge up top and then take a sleigh ride back down. Sign me up. But for summer, Northstar still has loads of charm that will satisfy many interests and appetites. I would have loved to play more golf, but as it turns out, this was a fantastic family road trip.